I want to change something, sometimes I notice the littlest changes have the biggest impact. In this post I am sharing my consideration of the significance and implication of the words “if” and “when”. Many years ago I stumbled upon this as a primary classroom teacher… so long ago actually, that I am unable to pinpoint when this knowledge came into being for me. Regardless, I have long been in awe of the power of these two little words and the shift in stance in terms of a relationship, or expectations within a relationship that the choice between these two words can convey. Immediately the term if makes it sound like a bargaining issue or something to potentially be negotiated. Now I am not suggesting parents not negotiate occasionally with their children – but I certainly suspect that most of us are not feeling that we are lacking opportunity for this type of interaction. Worse yet… it can lead us to nag or over-prompt. For those of us with children on the Autism spectrum, we too often know the pitfalls of over-prompting, or alternatively, dealing with a child who has the stamina to argue even the smallest point with the persuasive conviction of a highly paid barrister. My suggestion would be then to pretty much replace or substitute the word if with the word when. Any time we can do this as parents or as teachers, it removes a little bit of the potential for a power struggle, or the unintentional threat, and focuses on the desired behaviour in a positive and effective way. “Can I go on the computer? So, after reading this you may consider giving it a try. You might be amazed. I will shamelessly admit that I am rather convinced that when has certain superpowers… and the difference in the dynamics of meaning, expectation, and relationship conveyed in simple word choice continue to astound me! 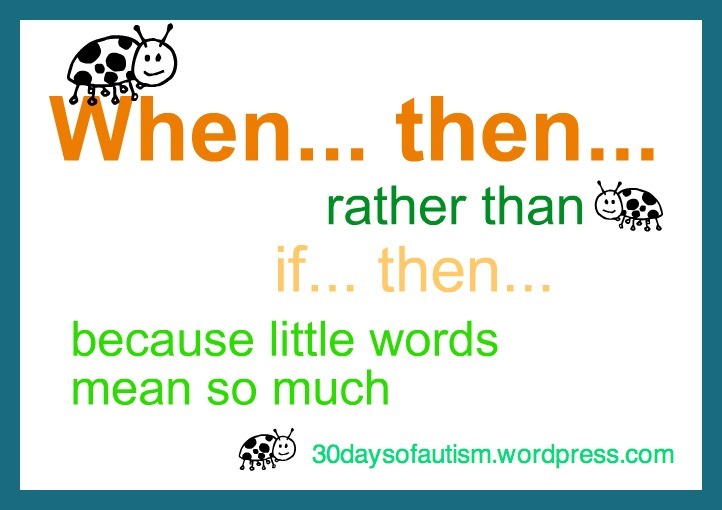 This entry was posted in Aspergers, Autism, Behaviour, Communicate, Parent and tagged Adlerian Theory, Aspergers, Autism, behaviour, communication, nagging, negotiate, over-prompting, parents, power struggle, strategies, The Power of if and when. Bookmark the permalink. That’s wonderful. I’m working on using better words with my toddler for better communications in the future, and this is a wonderful example. Thank you. I never really thought about it, but I don’t think I ever really use ‘if’ when speaking to my kids. I’m more likely to say something like ‘first homework, then computer.’ or ‘Yes, you can play outside after homework.’ There really isn’t any negotiation that way. That way I am saying yes as much as possible without it meaning they don’t have to do their fair share. Thank you for your comment Quiet Contemplation. You make an such an important point and connection. It is not really what words we use that matter in this shift – more it is the power of considering and replacing the conditional “if”. 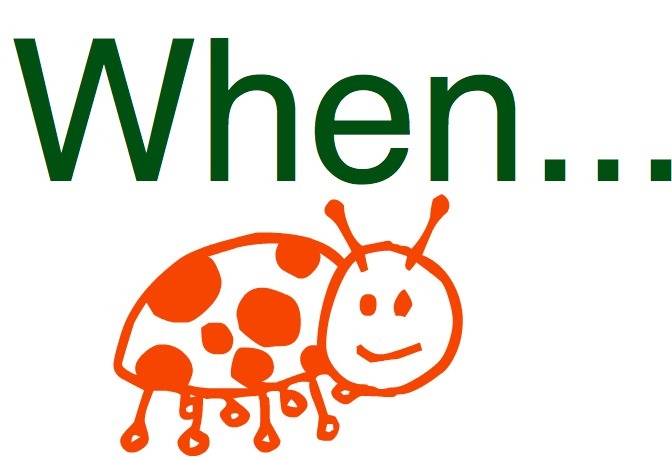 Programs/approaches that suggest the “First ____ , then ______” strategy are essentially doing the same thing, and many families and teachers are doing this already. I always appreciate it when you share your perspective! 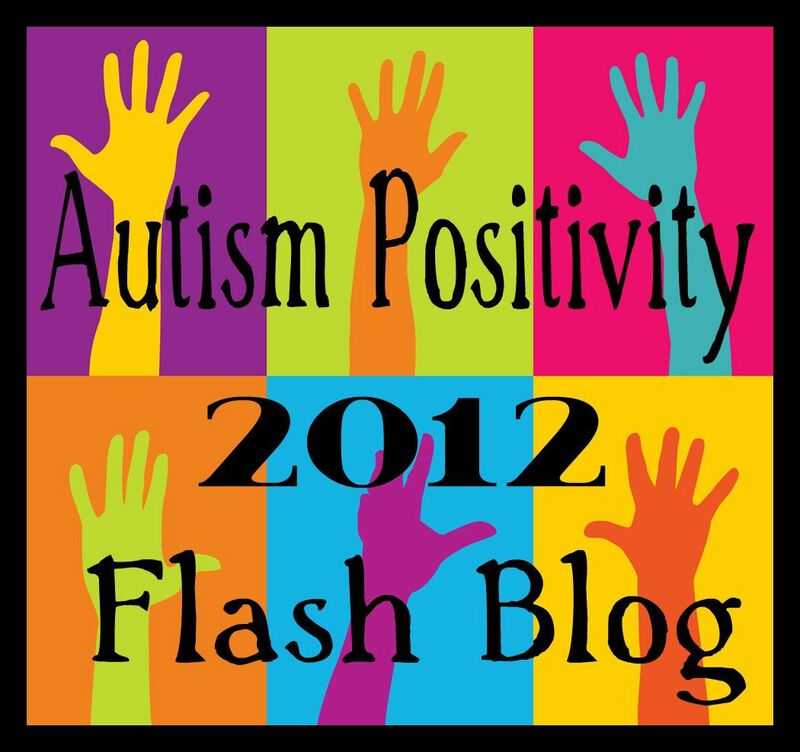 Great blog Leah! As an SLP, I find that those subtle semantic differences mean sooo much! When implies that the task will be done! Sounds so much more positive and the subtle implication is that you just KNOW that your child will do it! Keep up the good work! Just a reminder that “when” loses its power and magic if it never comes. Otherwise, I agree with this post. Once again, wish I knew this 25 years ago to use with my neurotypical children. It’s great parenting advice!